Collection levels tab - Website of the open source Sokoban game JSoko. This tab can be used to display and to modify the assignments of levels to a collection. Usually levels aren't distributed as single levels but are grouped in a level collection. This GUI can be used to display the levels assigned to a specific collection. It's possible to remove a level from a collection and to reorder the levels in a collection. The collection to be displayed can be set through the drop down box next to "Collection" in the top left corner of the shown graphic. It's also possible to enter the name of the collection to be displayed in this field. The levels of the collection are selected from the database every time the enter key is pressed in the "Collection" field or a collection has been selected from the collection drop down list. The graphic above shows a possible display of levels that are assigned to the collection "Disciple". You can select a table row or multiple rows with the mouse. The first selected level is displayed as graphic in the GUI. It's possible to change the order of the levels by double clicking a level number and then entering a new level number. Removes ALL SELECTED levels from the collection. This means you have to select the rows containing the levels to be removed first. Note: if the level has only been assigned to this collection after the deletion it's without any collection assignment. These levels can be selected in the Levels tab by either entering "*" as collection name or by selecting the collection "Unassigned levels". Closes the database GUI and loads the selected collection for playing in JSoko. 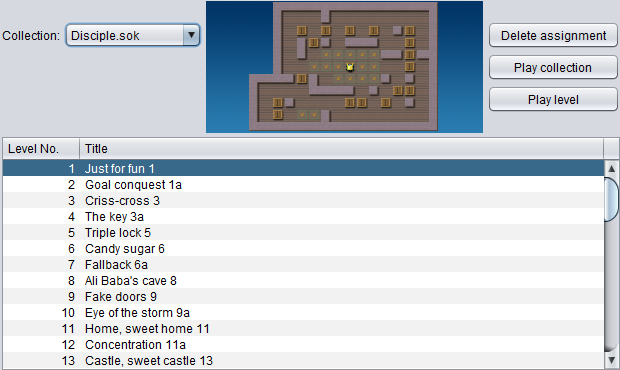 Closes the database GUI and loads the selected levels for playing in JSoko.